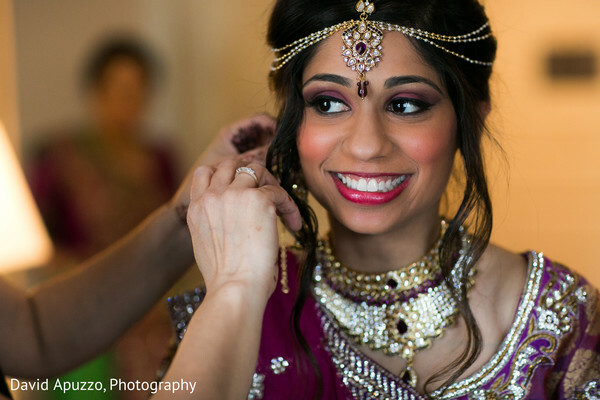 Here at Maharani Weddings, we are seeing a lot of Indian Fusion Weddings landing on our desktop! No complaints here, these weddings have been spell binding to say the least. 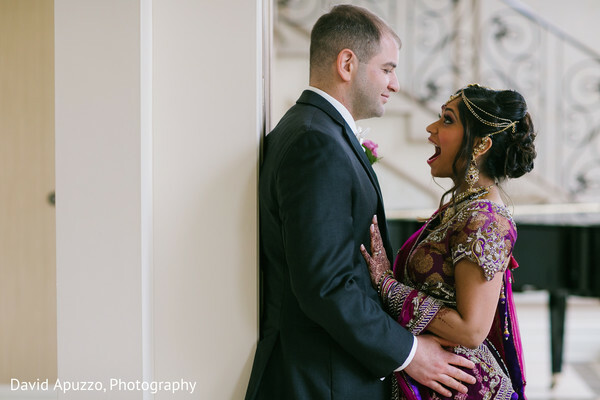 In Prospect, Connecticut, Maharani Ruchita wed her beau Justin with an interwoven fusion of two different weddings. The Indian wedding took place at Aria Wedding and Banquet Facility and was wreathed in décor by Mayuri's Floral Design. Ruchita radiated a captivating glow from the works of makeup artist MBDbeauty, LLC and donned an adorable up do with soft, dangling curls created by StyleBySmita. 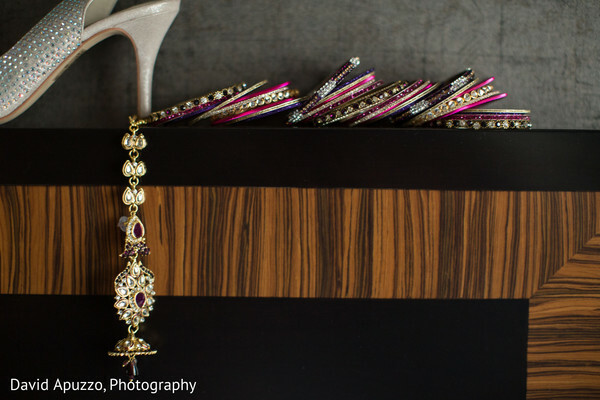 The event planner for this fusion wedding was none other than Mayuri Parikh of Mayuri's Floral Design. 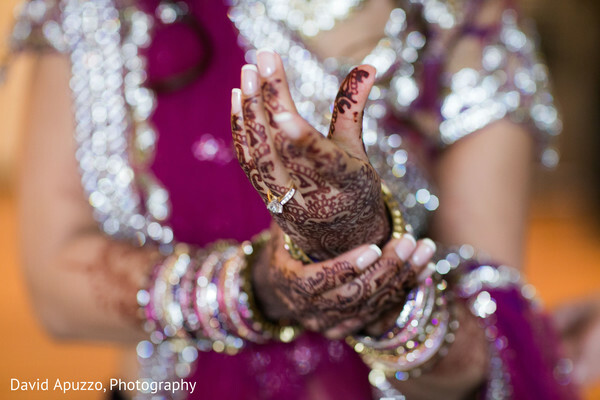 Our Maharani’s mehndi by StyleBySmita came out amazingly dark! 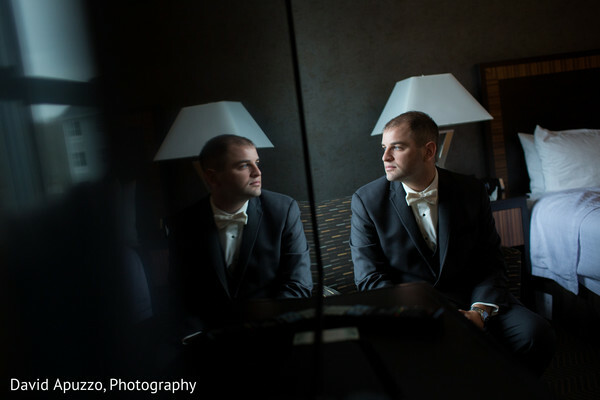 Justin looked dashing in his tuxedo by Formals by Antonio. Catering for this venue was provided in house by Aria Wedding and Banquet Facility with Dideo Films Photography behind the film lens and David Apuzzo, Photography snapping all the photos you see here! Step into the gallery for more pics and head to the bottom of this post for a chat with the Maharani! How did you meet your Raja and when did you know he was "the one"? We met "our junior year" at UConn as we entered pharmacy school. We had mutual friends but never really talked -neither one of us left a lasting impression. We both ended up a Ted Restaurant to celebrate after a hard week of studying for finals. I asked him "to buy me a drink now, and I would buy him one after becoming a pharmacist". I found him online and we talked everyday during break. He asked me out, and even though I said no, he chased after me for a year and finally won me over. And now, I still never pay for a drink (hehe). I knew he was the one, little by little everyday I was with him. His kind acts, genuine behavior, and most of all our mutual love, respect and understanding for one another just grew. Do you have a super romantic proposal story or engagement memory? Justin and I both work for the same company, Rite Aid pharmacy, so everyone knew we were dating. At the time, our schedules were a little different. He wanted to surprise me with a day off, so with some help from coworkers, he was able to make it happen. I knew Justin had a ring, cause we can't keep secrets from each other. I also knew he asked my parents to marry me before they moved away, but wasn't sure when it was going to be. One day before I had to go into work, I thought Justin was being fuzzy in the early morning. I was trying to focus on my extra 20 minutes of sleep before waking up for work. Before I knew it, he was trying to slip the ring on my finger before I woke up. I immediately jumped up and yelled in excitement. I said yes so fast, I'm unsure if he actually finished asking me. And the he told me, he got me the day off so we could celebrate. It was magical. Tell us about your wedding style. When you sat down to really figure out how your dream wedding would look, did you start with one central color, a palette of colors, or a theme that served as your inspiration? Honestly, I had so many ideas about how many wedding would be. And unfortunately, pinterest just confused me even more. Somehow my wedding florist/planner knew exactly what I wanted. Everything was even more incredible than in my dreams. I wanted a little bling bling, but still wanted a soft palette for my flowers. I gave my planner some pins I liked along with colors and she just went beyond my imagination. 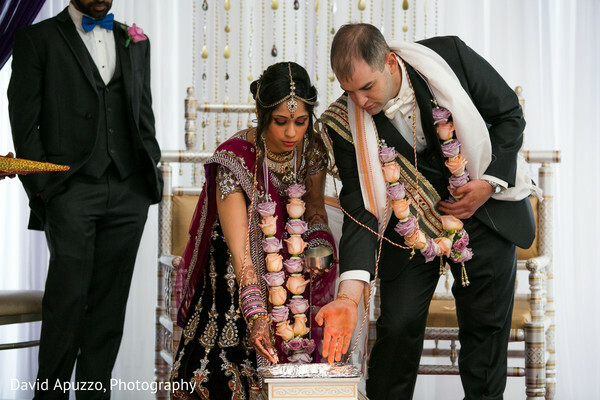 What did you enjoy most about the process of planning your dream Indian wedding? Shopping for dresses was hands down the best part of the wedding process. I felt like a magical princess trying on dresses. It was even more fabulous to have both a white dress and a lengha as well. And when I found the one, it was the best feeling. How did you choose your lengha or lenghas? Did you work with a certain designer? Did you spend hours on the internet first? My aunt took me shopping one day and I just feel in LOVE with this lengha. I originally wanted a red lengha, so even though I loved it, I said no. After shopping some more both online, and in multiple boutiques in multiple states, I didn't find anything with the right look. I ended up back at the first boutique months later, and as fate would have it the dress was there. It was great that my mom, who lives out of state, was there and also knew it was the one. I couldn't deny that the dress was for me. Looking back, was there a really special moment that you remember from your wedding that stands out as the most magical? YES! Our first look was my favorite! It was rainy and freezing outside, but I didn't feel cold at all. I was so excited to see "my future husband" and couldn't stop smiling. As I walked up to him, happier than I ever was, I tapped on his shoulder and he turned around. Staring into my husband's eyes was magical. Just holding his hands, I could feel the electric energy running. I just couldn't stop smiling so much, knowing this is the beginning of our future together. Did you and your Raja have a special song that you danced to as your first dance? How did you choose it? I was instantly drawn to the song Tum Hi Ho. There were many other songs we could have chosen but we just knew this was the one. The beat along with the wording is so beautiful and calming. As the wedding day represents become one, we thought this song would be the most appropriate. How about hair and makeup? Did you already have a style in mind or did you work with a specialist to find your perfect look? My makeup artist did an absolute amazing job! I told her I was looking for a bold look and showed her my Indian wedding dress. 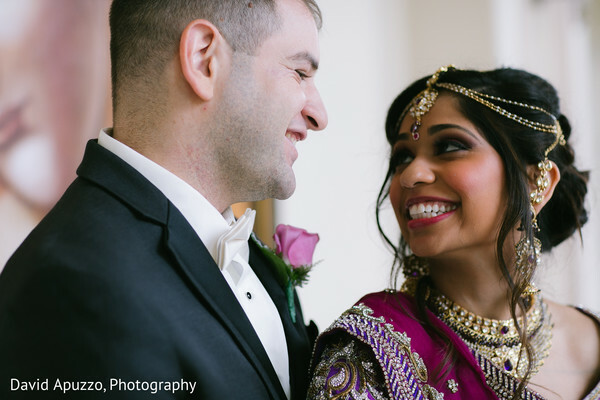 I didn't have to let her know much, she was able to come with the perfect look for me and my big indian-jewish wedding. My hair stylist did an incredible job! I knew I wanted some braiding in my hair and wanted it up. She listened to what I wanted and created something based on my style and that complimented my face. Did family or friends help out with certain special details that really added to the event? My auntie made the ceremony trail mix snacks, everyone loved the little snacks to munch on prior to the wedding. My neighbors helped with me with my wedding favor; they bought Hershey kisses and stuffed the decorative containers. My parents helped with some many little things from the shower to the rehearsal dinner, I couldn't have done it without everyone's help! Please ensure you check back as we return back to Aria, where these two lovebirds will wed in another fusion ceremony!